March 22. Registration is open for the 2019 Academy of Political Leadership hosted by the Lake Norman Chamber and the Greater Statesville Chamber of Commerce. The academy, which has room for six people from Mecklenburg and six from Iredell, is a nonpartisan program designed for anyone interested in running for elected office. 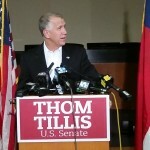 Previous attendees include US Sen. Thom Tillis, before he was elected to the Cornelius Town Board. Other participants include Dan Boone, who ran successfully for Huntersville Town Board and Rusty Knox, who went on to become mayor of Davidson. Training sessions include discussions on ethics, campaign planning, research, targeting voters, fundraising and messaging. The mission of the program includes determining “whether you possess the basic traits necessary to run for office” as well as identifying all the elements necessary for a campaign plan. Participants will be selected by an application process with consideration given to ensure a politically diverse class. The cost is $95 per person and includes meals. Applications must be received by April 12. More info: Call Greater Statesville 704-873-3304 or Lake Norman at 704-892-1922.